Guillaume Boivin (born 25 May 1989 in Montreal, Quebec) is a Canadian racing cyclist, riding for the Optum p/b Kelly Benefit Strategies team. His greatest cycling accomplishment was finishing in a dead heat for the bronze at the World Under-23 Road Race Championships in 2010. He finished 3rd in the 2012 Tro Bro Leon, getting on the podium with his teammate Ryan Roth, who won the race. In October 2014, it was announced that Boivin would leave Cannondale and ride with Optum p/b Kelly Benefit Strategies in 2015. 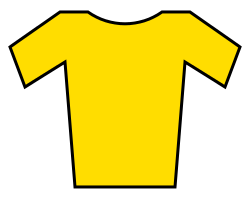 On 29 April 2015, on the first stage of the Tour of the Gila, Boivin was the last man remaining of a breakaway that was caught by eventual solo winner, Rafael Montiel. Boivin took the second place of the mountaintop finish. 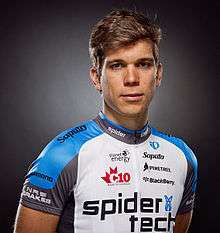 1 2 "Team SpiderTech Biography – Guillaume Boivin". Team SpiderTech official website. ↑ Atkins, Ben (3 December 2012). "Lucas Sebastian Haedo to Cannondale Pro Cycling in 2013". VeloNation. VeloNation LLC. Retrieved 4 January 2013. Haedo will join Sagan, Guillaume Boivin – who joins from Spidertech p/b C10 – and Elia Viviani as one of the team’s sprint specialists. ↑ "Phinney, Boivin tie makes U23 Worlds history". ↑ Quénet, Jean-François (15 April 2012). "Roth wins Tro-Bro Leon". Cycling News. Future Publishing Limited. Retrieved 16 April 2012. ↑ Maxwell Nagel (2 October 2014). 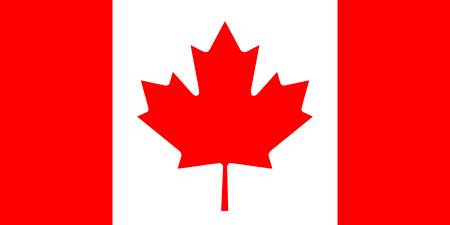 "Optum signs three Canadian riders for 2015". VeloNews. Competitor Group, Inc. Retrieved 3 October 2014. ↑ "Montiel, Abbott strike first at Tour of the Gila". Cyclingnews.com. Future plc. 29 April 2015. Retrieved 29 April 2015.